Happy Home Baking: Happy Birthday! Time has zoomed passed so fast that unknowingly, another year has gone by. It seems like my son has grown up at such a tremendous speed that I have no choice but to accept that he is a big kid now. Looks like I have only a few more years to have him all for myself before he spreads his wings and embraces his own world. As I was expecting a crowd, I made an 8" cake by adapting my favourite 7" sponge cake recipe. I was glad that the sponge cake turned out well as I was really just trying my luck to meddle with the ingredient amount! I whipped up some non-dairy cream and added in some durian pulp. It tasted yummy! Then I sliced the sponge cake into three layers and sandwiched each layer with some non-dairy whipped cream followed by a layer of fresh durian pulp. The cake was then covered with the left over durian whipped cream mixture before it was covered generously with lots of oreo cookie crumbs. Except for a couple of kids who are non-durian lovers, all the guests enjoyed the cake. The durain was really good...it was very creamy and came with very thick flesh and had got a bitter sweet taste. An excellent choice to please both 'camps' of durian lovers...those who prefer sweet durians vs those who just love a stronger bitter taste. It's a pity I didn't have the chance to take a photo of a slice of cake. Even though I love the cake, I doubt I would make it again any sooner as I really couldn't stand the stinky fridge after having this durian cake sitting in it all night! Sift cake flour, set aside. Line the sides and bottom of a 20cm (8 inches) round pan with parchment paper, set aside. Pre-heat oven to 170degC. Position rack at the lower bottom of the oven. With an electric mixer, whisk eggs and sugar on HIGH speed for about 5 to 7 mins, until the batter double in volume and is ribbon-like (the beater should leave a ribbon-like trail when the batter is lifted up). Turn to LOW speed and whisk for another 1 to 2 mins. Whisking at low speed helps to stabilise the air bubbles in the batter. Add sifted cake flour into the batter in 3 separate additions. Gently fold in the flour with a spatula each time the flour is added. Take care not to deflate the batter. Pour the batter into the pan and bake for 30~35 mins, or until a skewer inserted in the centre comes out clean. Unmold and invert onto cooling rack, remove parchment paper and let cool completely. Blend durian flesh (Ingredient B) until the pulp becomes smooth*. (As the durian flesh is quite thick, the blade of your blender may not work properly, stir the mixture with a spoon or add one or two teaspoons of water to get it going. *Depending on preference, blend the durian flesh to the desired consistency, I didn't blend it till very smooth, there were still tiny chunks of durian pulp/fibre.) Do the same for Ingredient C.
Dissolve the sugar in hot water (Ingredients D). Let cool. Slice the cake horizontally into 3 layers. Place one layer of the sponge cake on a 20cm cake board. Brush the surface of the sponge layer with the sugar syrup (this is to keep the sponge layers from drying out upon chilling). Spread about 1.5 cups of filling evenly on the sponge layer. Spread half of the durian puree (Ingredient C) evenly over the filling. Brush both sides of the second layer of sponge cake with the sugar syrup and place it over the first layer. Spread with 1.5 cups of filling followed by the remaining durian puree. Brush both sides of the last layer of sponge cake with the sugar syrup and spread the remaining filling on the surface and sides evenly. Leave the cake to chill in the fridge for at least 3~4 hours. 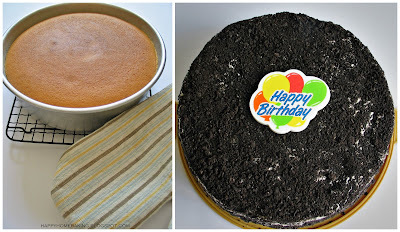 Remove cake from fridge and cover the whole cake with crushed oreo cookie crumbs (remove the fillings between the cookies) and decorate as desired. Keep the cake in the fridge before serving. my family loves durian...and my father's birthday is coming up end of this month. thinking of trying out this cake..can share the recipe pls? I really think you should post the recipe. I'm sure there are many durian lovers who love to try this. Including me. Heh! Can I just ask you a question - why is it when i bake my cakes tend to erupt at the centre. Yours look so nice and even. Is it because my oven is too hot? What an interesting combination - durian and oreos. Never would have thought of that. I love durians but don't think I'll make the cake. I'll probably eat all the durians first. Hahahaha. wow! durian and oreo.. very creative.. hehe.. I would love to make some for my mum some day.. Try putting teabags in fridge, it helps to absorb the lingering smell of the durian. Time flies doesn't it? It's quite scary thinking about it. A good way to celebrate his birthday before the term starts. I wonder how was the taste of durian & oreo! Hahaha... I'm quite skeptical to add anything to durian as durian just dominates all other stuff! I'd really like to have the recipe for the durian cake though. My dad just dumped some durians for me to bake! Hahaha...I need your recipe desperately! Thanks in advance! The durian cake looks great! They're so rare and expensive here in the UK though. The last one we bought cost £18 (18.00 GBP = 43.1807 SGD). I'm not sure I trust my abilities enough to risk baking with it! I've been a fan of ur blog.. love the way u illustrated ur thoughts & recipes..
Hope u can share ur durian cake recipe, can't wait to try it out.. Happy belated birthday to your boy. Its is really fast, i mean the speed they grow. My boy gog P1 next yr .. can't imagine he will be away for so long in school. I am sure your big pool of fans (which includes me) will be waiting eagerly for your recipe. keke. I also can't stand odours in the fridge! Good tip for you: just place a small saucer of coffee powder in the fridge, it helps to absorb odours very well :) Gd luck! I would never have thought of putting Oreos and durians together but it sounds like an intriguing combination. Hi Yuen, Kristie, thecoffeesnob, I tried with baking soda, yet the durian smell is still very strong when the cake is in the fridge. Once the cake is removed, it was ok.
Hi Lian, tracieMoo, KWF, Jane, thecoffeesnob, I am not creative at all, this combination is sold at our local hotel famous for their durian cakes. Instead of spending money to buy the cake, I thought I should make one. It was also part of the reason why I was a little hesitant to post my recipe...although I didn't follow any recipes exactly, I am still very concerned about copyright issues. Don't worry about oreo not matching with the taste of durian, the cake tasted really delicious, trust me! Hi Kristie, my younger boy did taste a little bit which made him almost wanted to puke ;) Whenever we have durians, I will get him to try a tiny bit, I am training him to accept the smell and taste, but it seems like when a person hates the fruit, it will be a tough order to change it! That's the yummy cake, I'm sure children will love it and... I do :P Happy Birthday to your son! me love your cakes and their designs...me just recently took up baking...just wondering about the sponge cake...the spongecake I did with your recipe the texture went well but the bottom of the cake stuck to the pan and wasn't very smooth and has this eggy uneven texture...do you happen to know the reason? thanks so much! thks for sharing the recipe! noticed that you have removed the cream from the biscuit. sorry for asking a silly question, but what do u do with the cream? throw it away? i intend to bring it out to the restaurant (most likely) for the celebration...do u think it can survive the trip there cause i read that you need to refrigerate the cake till the point of serving. Hi Lee, you will need to line the base of your pan with parchment paper, it will be easier to unmold the cake. I am not sure what went wrong, but if the texture of the cake is alright, then maybe the bottom was under baked? You may have to adjust your oven temperature. Ho Octopusmum, no I didn't throw it away, my kids were more than happy to finish up the cream! The cake should be refrigerated before serving, I need to add this clause because in the past, I have readers asking me whether such kind of cakes should be left at room temperature or chill. I am sure it can survive the short trip...just like any other cakes we got from bakery shops. Happy Baking! this must be so good! How many durians do we need to buy to get that amount ? I wonder do PH sell ready made durian puree ? Geee... I have a box of durian sitting on my fridge can make for my birthday. How many cans of Nestle cream do we need to buy ? Hi Anonymous, I used about 2 medium-large size durians. Hi Kim, no, I didn't use Nestle cream, I used non-dairy whipping cream. Nestle cream (in a small tin) cannot be whipped. Sorry, may I know the brand of non-dairy cream ? Hi, I bought the non-dairy cream from Phoon Huat, the brand is 'Redman'. Thanks very much for your recipe! So as not to let your effort go waste, I did attempt this cake on Saturday. However, my folding of the flour, again, failed me. Luckily I still manage out the cake. The taste, like you mention, is really great! Thanks again for sharing! yummy!! Hi Octopusmum, the sponge cake should be soft and yes it taste like ji dan gao. I am sorry I didn't notice how long I take to fold the flour. As I am no expert in baking (I have not attended any baking class or workshop, I learned thru cookbooks), so I am really in no position to give any advise, sometimes I really do not know whether I am doing the right thing. Maybe you can try out other recipes posted by other bloggers or professional bakers? I am so sorry, I have of not much help here. thks so much for your reply...there is no need to apologise! u haven't attended any classes but yet, able to churn out so many goodies..u are really talented! Reading your comments, I can't help but to empathise with Octopusmum too because I faced the exact situation as her in folding the flours! It just wasn't ez, and I really dunno how HHB managed to do it so nicely. Octopusmum, we'll perservere on ya? For easy folding in of the flour, you can try shifting the flour a few times before using. When ready to add into the batter, you can sift over the flour directly into the batter. Add the flour in 3 separate additions. With each addition, fold in with a spatula. Slide the spatula starting from the side of the bowl and work it all the way down into the bottom, simultaneously turn the bowl at the same time, and lifting up the batter with the spatula. Work quickly and yet gently! Practise make perfect and I hope both of you will not give up. I am sure you can bake a nice sponge cake on your next attempt. Cheers! Thanks very much for your explanation. Will have to try it again as I love the milky smell of your sponge cake! Hi KWF, no I didn't face this problem. It depends on the amount of butter/oil used in the recipe. For my 18cm sponge cake, I simply pour in the melted butter into the batter and fold in. Some recipes will recommend that you drizzle in the oil/butter and not dump it in one go. Or, first remove 1/3 of the batter and mix it with the oil/butter, before mixing this mixture with the rest of the batter. However, no matter what, after adding the liquid (oil/milk), etc, the batter will deflate a little. As long as he finished cake is able to rise almost to the rim of the pan, it should be ok.
Do you know what went wrong? Is it still due to the folding of the flour/liquid? I was wondering, did you beat the egg and sugar mixture until it turned thick, pale, double/triple in volume, and leave a ribbon-like trail (it shouldn't disappear instantly) when you lift up the whisk? I think this step is very crticial to ensure the cake will rise during baking. I have been following your thread regularly and have been very motivated to bake though I am still new at it. My old mixer (which was passed to me by others) just broke. Can I check which mixer you are using? Any good recommendation? I'm sorry, I do not have a standing mixer so I am not able to recommend any one. I have tried your durian cake recipe because a friend of mine asked to make one . After I sent the cake to my friend I couldn't resist to make one for me and my family since all of us are durian lovers! And the cake is absolutely super duper YUMMY ! OMG....there's only one word that cross my mind when I was enjoying the creamy cake...HEAVEN. My kids love 'em too and they even ask for durian cakes for their upcoming birthdays ! 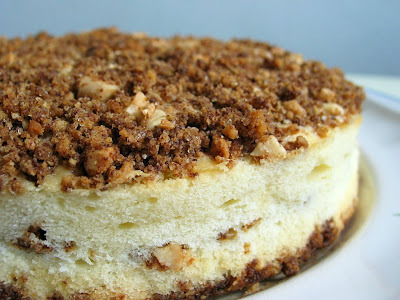 I have posted an entry about this durian cake in my recipe blog. thank you HHB for this wonderful recipe! Hi, no, the cake doesn't have a strong egg taste. Maybe it is because I used vanilla extract? Is it a Tart or a Pie?